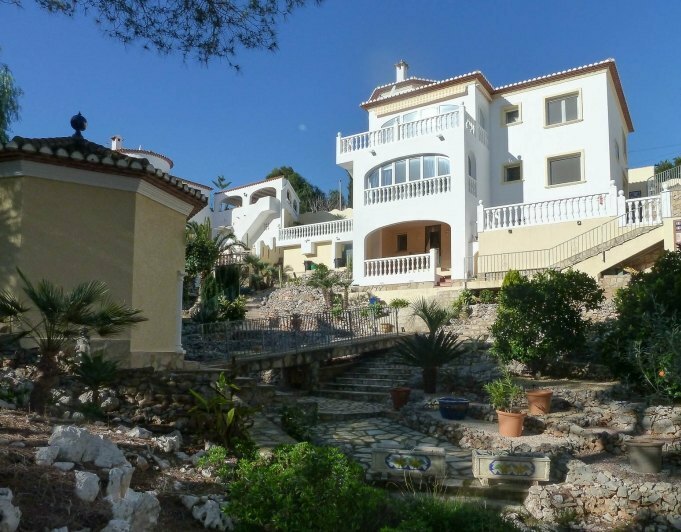 A fantastic opportunity!This detached villa is located on the quiet urbanization of Monte Pego, only 7 km from the sea and a short drive from Pego town and all it’s amenities. This stunning property has many extras including beautiful sea and panoramic viewsThe upper and main floor has: an entrance hall, 2 bedrooms, 1 bathroom, a livingdining room, an open kitchen, 1 glazed terrace with wonderful views and lots of open terracing. On the ground floor there is 1 bedroom, 2 bathrooms with shower, a laundry room, a storage room and a nice wine cellar. The exterior area has several terraces, an 8 x 4 heated pool, shower h / c, a summer kitchen, 1 pergola and parking for 2 more cars. Among the many extras we highlight: fitted wardrobes, wooden beams, oil central heating with radiators, a wood burning fireplace, wood and aluminum double glazed windows with blinds and mosquito nets. The property is sold furnished including electrical appliances. Don’t hesitate to ask us for a viewing of this wonderful property without obligation! 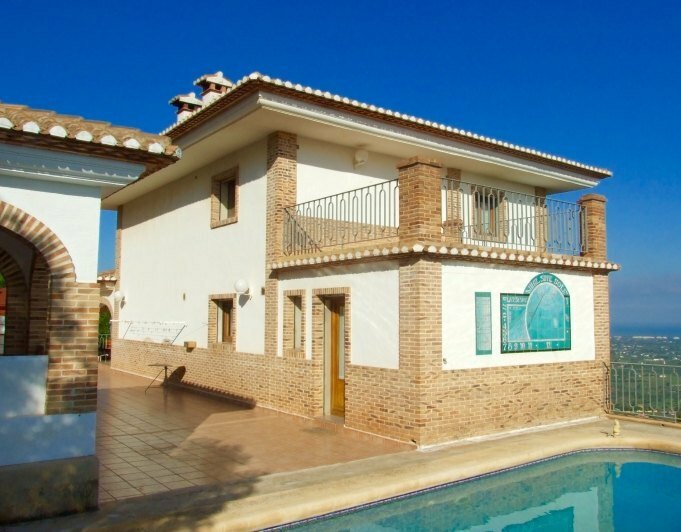 Villa for sale in Denia. Not far from the town center and the beach. Sunny plot in the lower part of Montgo. Garage, swimmingpool, garden, heating, airco, ready to move in. Villa in Denia, located in one of the best areas of the Montgó.In the cami de San Juan, just 1.5kms from the Centre of Denia and a few meters away from supermarkets. It can be perfectly within walking distance to the Centre of Denia. Area very quiet and sunny throughout the year, which is located on the slopes of Montgó.The House is distributed in a plant. It consists of a large living room with direct access to the covered terrace and the garden, two bedrooms one of them with en suite, large open kitchen and another bathroom.The House has an attic already with electricity and water, which is enabled to build two more rooms.Good views of Montgó.Come and visit it!! Villa for sale in Denia in rustic style. Two houses with their independent entrances, 1 km from the town center, air conditioning, central heating, osmosis device. Large swimmingpool, summer kitchen, garage, tool room, wine cellar, is sunny and surrounded by trees. Villa in Denia for sale in Marquesa residential area. It is distributed like this: On the first floor, large living room with open plan kitchen, access to a terrace of 15 m2 with magnificent views of the mediterranean sea. On the ground floor, you find an access to the swimming pool with 38 m2, there is a spacious living room, a bed room, a bathroom and a very large storage room. The plot is 900 m2, garden, bbq, the house has underfloor heating, and all the electrical installation and plumping were renovated a few years ago. 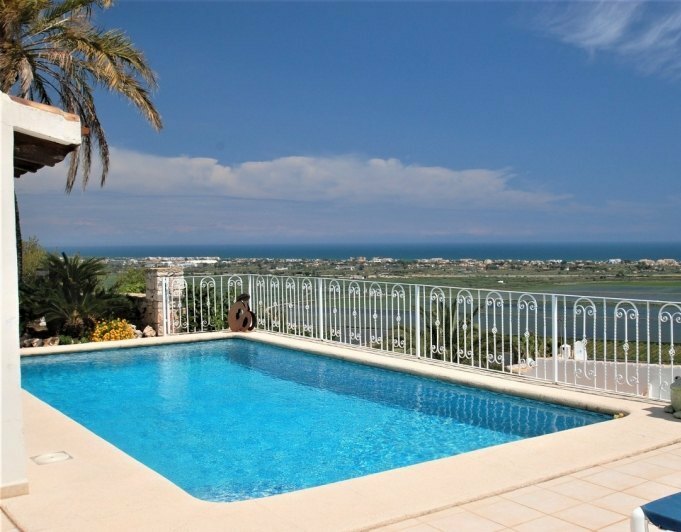 Villa with sea views in a very soughtafter area in Denia, 10 minutes drive from the Centre and from the beach. Almost flat plot of about 800 m². The house enjoys plenty of daylight and has open terraces open on the groundfloor and the upper floor with a total of 75 m². Large living room, kitchen with block island, dining room, two bedrooms with fitted wardrobes on the ground floor and a mezzanine convertible in a third bedroom with access to the solarium, two bathrooms with shower. Summer kitchen with windows, basement with plenty of storage space. Carport with electric sliding gate, oil central heating, air conditioning hot/cold. Osmosis system, beautiful garden with lawned area. A house also ideal for living all the whole year round, enjoying unbeatable sea views. 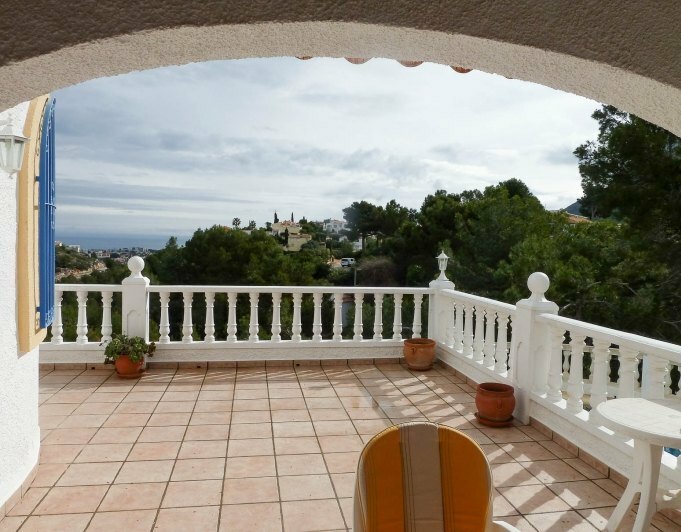 House to be refurbished with a plot of 700 m² in an area ideal for holidays or to live throughout the year for its proximity both to the beach and to the center of the city. The house is on the first floor which is composed of entrance, living room with fireplace and exit to the terrace of approximately 20 m², kitchen with pantry, 3 double bedrooms with fitted wardrobes and 2 bathrooms. On the ground floor there is a storage room and the rest is open and allows an expansion of housing.Fenced and sunny plot with many fruit trees such as orange, lemon and medlar trees which enables the construction of a swimming pool. Parking.The access to the house is through a culdesac. Quiet and requested area, just 350 metres from the beach of la Marineta Casiana and from the promenade of las Rotas and about 20 minutes walk from the centre. 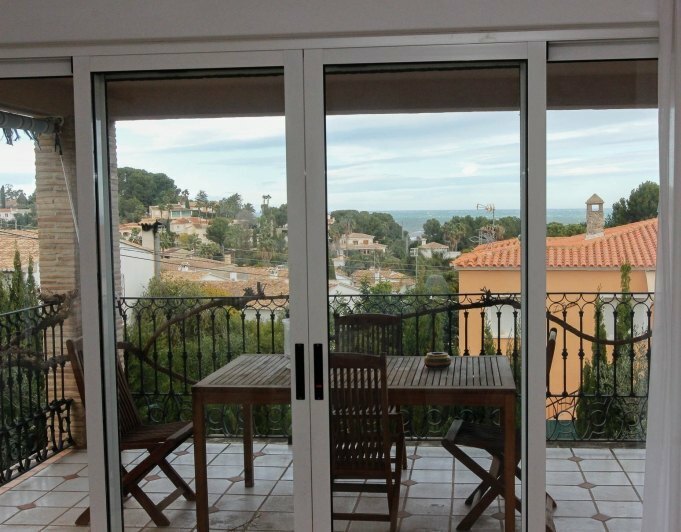 Chalet for sale in Denia, zone Montgó, semi new, well preserved and ready to live.This villa for sale in Denia is broad and has various terraces, very sunny and panoramic, unobstructed and views of Montgó. It has a garden with much charm and is a House with many possibilities, with a basement that can be extended. With private plot of about 980m 2, barbecue, fireplace, heating by radiant soil and 2 houses, master with 2 bedrooms and 2 bathrooms, lounge and kitchen and bottom for guests or for rent with 2 more bedrooms, lounge, kitchen, bathroom and toilet.A house where tranquillity reigns. If you would like to buy a villa with posilbidades.Spacious villa for sale in Denia, adapted for the handicapped, about 300 m 2 constructed, consists of 2 houses. Master with 3 bedrooms, 1 bathroom, 1 toilet, living room and kitchenette. Basement with windows to the outside with 3 bedrooms, living room, kitchenette and 1 bathroom. With many extras, air/heating, central heating, open views to the sea, garage with laundry + carport, etc.Buy villas in llunadenia, real estate services is getting easier by the large amount of offer, although this one has something that makes it different... discover it. House close to the beach with garden and pool, east orientation. 285 m2. built, good condition. It has 5 bedrooms with fitted wardrobes, 3 bathrooms, 1 living room, 2 terraces, private swimming pool and carport.